We have many exciting changes for Sunday School for the 2016-17 school year. Classes begin on September 11, 2016. All are invited to join these small groups and make some new friends, 10:00 until 10:45 AM. We provide childcare for all College Park related activities. Our childcare is provided both by Preferred Childcare, Inc employees and College Park volunteers. All Preferred Childcare, Inc employees undergo continual background checks, have been trained in child/adult safety, and are CPR/first aid certified. All College Park volunteers also have continual background checks and may be certified in CPR/first aid. This fall our toddler class will explore the stories of our faith in a rotation of hands-on lessons and music. Guidelines for providing childcare for this age group is the same as the guidelines for the nursery with the addition of a Sunday school hour. This fall our children will explore the stories of our faith in a rotation of hands-on lessons and music. 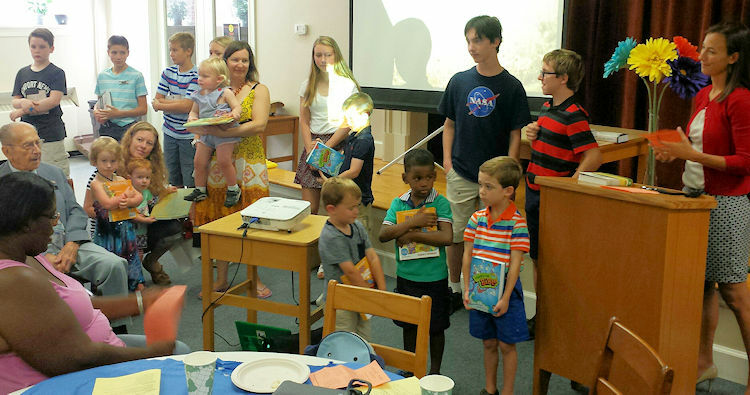 Our children’s Sunday school program allows our children to explore musical variety and gifts, while the weekly gathering provides opportunities for our children to build the foundation of their faith and develop friendships with one another that will carry them through their years in the youth group. In this hour, our youth will engage in relevant conversations about life and faith. We hope that when our youth leave CP, they have the ability to continue some form of personal, spiritual practice and that they have the tools to critically read and consider the sacred texts of their faith. Our adult classes offer a variety of approaches to engaging faith in our everyday lives. This class reads and discusses a variety of Christian literature. This fall the class is reading Buechner 101. This class is reading through the Bible together. Last year the class read and discussed Genesis. This fall the class will read through the four gospels. This class explores and discusses a variety of faith topics. This fall the class is considering the many ways faith is portrayed in art, music and poetry. This class uses the Smith and Helwys Sunday school curriculum to guide their conversations of faith, Bible and life.